Playing flamenco guitar will take a lot of practice, but it’s a beautiful style of music, and very different from other guitar styles because it uses not only just the notes themselves but also percussive techniques. 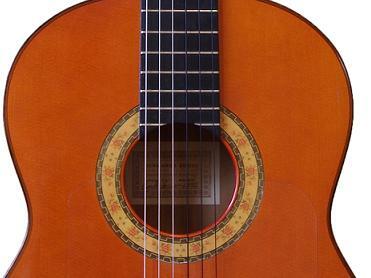 If you’re just starting to get into the flamenco guitar style, read on to learn some basic lessons! Flamenco guitars are usually a bit pricier, so for a beginner just starting out, you might want to start with a basic nylon string acoustic guitar, because its sound will be closest to that of a flamenco guitar. A steel string guitar would sound much different and have a different feel for your fingers, so try to practice on a nylon string if possible. Once you know the basics and have advanced to a higher level, you could then see about investing in a real flamenco guitar. In flamenco guitar, a lot of music is played in only one of two keys, the key of A or the key of E. For A, the chords are Dm, C, Bb and A. For E, the chords are Am, G, F and E. The best thing you could do is to practice switching between these chords in each key, until you can do it fluently. Once you can do that, you can better focus your efforts on practicing strumming and percussive techniques. As mentioned above, flamenco guitar playing involves a lot of strumming and percussion, as well as regular note playing. But the strumming part is very important to the style, so you should definitely dedicate a lot of practice time just to working on these techniques. There are several different rhythms you can use, but this is one of the basic ones, called a Rumba: it involves first smacking the guitar body (for a percussive effect), then strumming up with your index finger, then down with your index finger, and then up with your thumb. You could repeat that a few times with one chord and then repeat for the next chords in the progression. Of course, there’s a lot more that goes into playing flamenco guitar well, but these are the basic lessons for a beginner to start with. Once you’ve gotten a handle on these, try learning more rhythms and percussive techniques, and adding more chords to your repertoire.